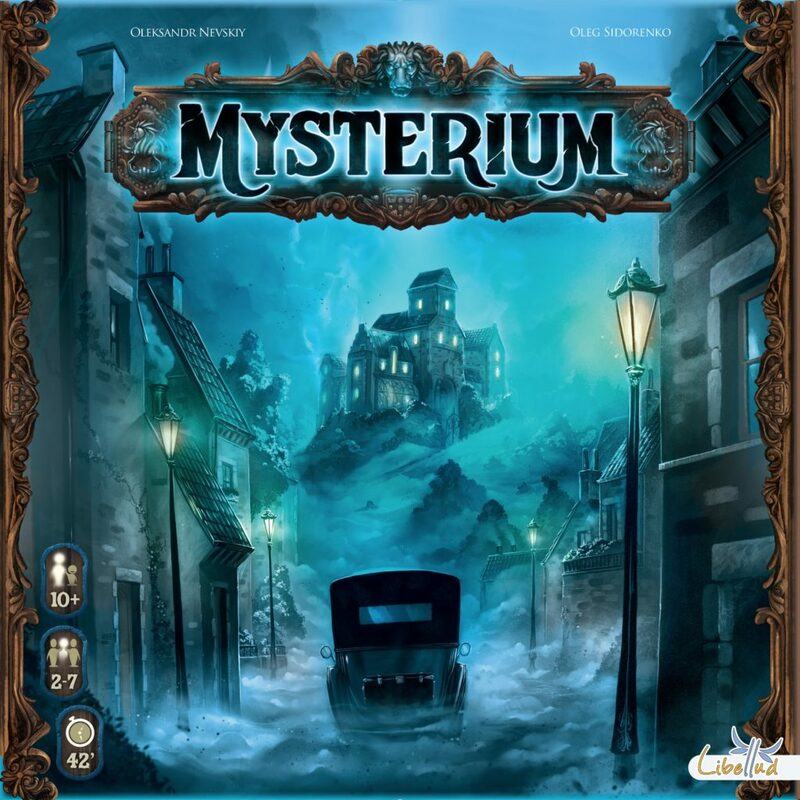 Mysterium is a murder mystery board game with a dreamy twist that was designed by Oleksandr Nevskiy and Oleg Sidorenko, and is published by Asmodee. A group of physic investigators enter a haunted manor and, with the help of a ghost, try to figure out who committed a nasty murder. The goal of Mysterium is simple: Don’t let the murderer get away with it! The cards in Mysterium are the main focus of the game. Each investigator must look through the dream cards, the location cards and the weapon cards in order to figure out who their specific suspect is. The player who has the role of the ghost knows the answers to these questions, but they must enter the investigators’ dreams in order to give them the clues. The investigators have seven rounds (days) to figure out who the murderer is or they lose. The first stage of Mysterium is the dream stage, in which the ghost selects clue cards to give to the psychic investigators. Each investigator has his or her own suspects, so they are all getting different clues. The investigation stage then begins and the players try to figure out the face-up cards that the ghost was referring to. Players can give each other tips, but it’s ultimately up to each individual to choose the right cards. Finally, the ghost tells each player if they were right or wrong. If anyone guessed correctly, they can move on the the next row of cards. Anyone who guessed incorrectly will have to try again next round. Once the round is done, the day moves ahead. If all of the investigators are able to figure out their suspects in time, then one more round happens and the players work together to figure out who the real murderer is. Mysterium oozes theme. The theme is both unique and immersive, so most groups should have no problems getting into the story as it is unfolding. The artwork in Mysterium is amazing! Each component looks fantastic, but the dream cards are the highlight of the game. The artists, Igor Burlakov and Xavier Collette, should definitely win some awards for the job they did on these cards. Because the cards have so much detail, you can pick out a lot of different clues in each one of them. That adds to the challenge for the investigators while also making it a little bit easier on the ghost player. It may seem like a horror game, but Mysterium is actually very family friendly. The interactions between the investigators and the attempts at team deduction lead to a very fun experience for players young and old. Mysterium scales extremely well for different player counts and difficulty levels. You don’t change any of the rules no matter how many investigators are playing, and you can just add in more cards to make the game a tougher challenge. I do worry that the base game will become stale over time. There are only so many cards in the game, so if you play through it many times with the same set of players, it could become pretty easy to figure out the clues. Future expansions should certainly add to its replay value, though. There can be a bit of downtime in this game. Sometimes it is tough for the ghost player to come up with clues for everyone, so the investigators might have to sit there doing nothing for a few minutes. 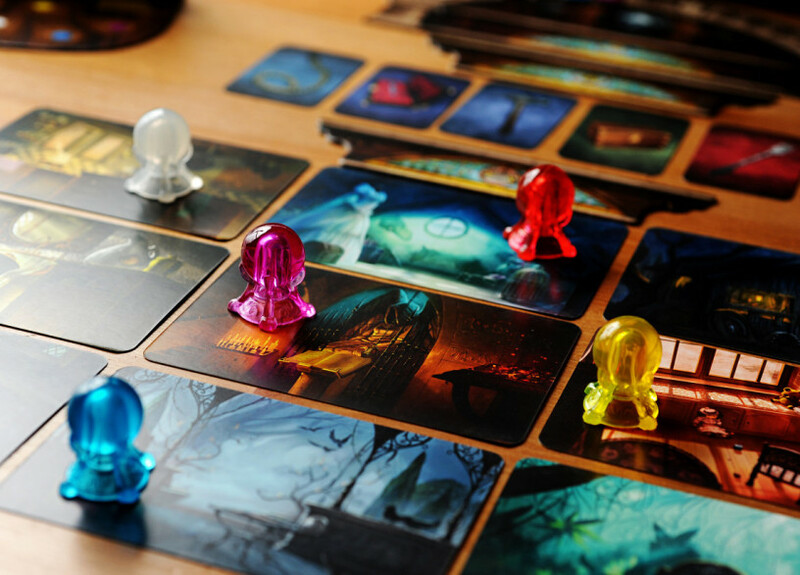 If you are a fan of murder mysteries, chances are you will love Mysterium. If you like thematic games, or deduction games, you will probably love Mysterium. It also happens to be one of the best family games out there. I think all co-op fans should at least give this one a try, but if the theme doesn’t interest you, I don’t think the gameplay will make up for that. Mysterium one is definitely staying in my group’s collection. Even when it gets frustrating, we really enjoy working as a team to solve the cases. Even if we don’t play it a lot in the future, Mysterium will be a board game worth owning for the fantastic artwork alone! You can test out the game by getting the Mysterium app for iOS, Android, or on Steam. Thanks for taking the time to read our Mysterium board game review!